Breaking Announcement: DB SCHENKERjetcargo division today launched a new weekly air cargo service linking Hong Kong, China (HKG), to Chicago, IL (ORD), and Houston, TX (IAH). Fulfilling the needs of the Oil and Gas and Automotive sectors, the new service – with guaranteed capacity – will use Boeing 747-8 F aircraft. The convenience and speed of this new weekly air charter service will benefit DB Schenker’s U.S. Midwest customers with freight moving from Southeast China to the U.S. Southwest, Gulf of Mexico and Northern Mexico. 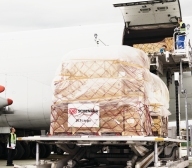 DB SCHENKERjetcargo offers three airfreight solutions with defined lead-times, no dimensional or weight restrictions, and end-to end online tracking. Service options include: 1-2 days (First Class), 3-4 days (Business Class), or within 6 days (Economy). Cargo will include, but is not limited to, Oil and Gas, Project Cargo, and Automotive equipment and supplies. Dedicated customer service / sales specialists to help design a solution that meets customers’ business requirements. DB Schenker is one of the world’s leading providers of integrated logistics services, offering land operations, air and ocean freight as well as comprehensive logistics solutions and global supply chain management from a single source.